The Secrets Of The Six-Pack! Defined abs draw in the eye like no other muscle group. To get them on your photo feed this summer, you have two choices: Take Photoshop classes, or get serious about your training and diet. You know the right answer. For far too long, we've been tricked into thinking that abdominal training has to be visually absurd in order to be effective. If you weren't on your back doing your best imitation of a possessed Barcalounger, you were quivering atop an inverted Bosu ball, posing an imminent threat to yourself and anyone within 10 feet of you. Want to know a secret? It doesn't have to be this way. 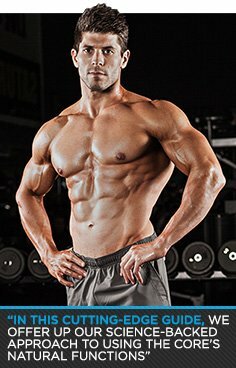 The more that researchers and coaches learn about how the core really works, the clearer it becomes that the way to strong, defined abs is to train them like any other muscle group: by training hard with good form, a strong foundation in anatomy, and a principled approach to nutrition. In this cutting-edge guide to getting cut, we offer up our science-backed approach to using the core's natural functions to build a midsection that can take a punch and look the part while doing it. You'll learn about the simple lifestyle choices that make the difference between washboard and smooth-as-a-board. A pro fitness model shares his training and diet tips for building a sustainable six-pack that you can enjoy year-round. And a certified strength coach offers up a full-body strength program built around the world's simplest ab device: a single heavy dumbbell! It's OK if you keep this info to yourself, but good luck keeping that new midsection under wraps! It's a momentous occasion when your abdominal muscles finally spring into view! It means ''before'' is long gone and ''after'' is in sight! Learn how stay six-packed year-round. What's that sound? It's you, moaning and holding your aching abdominals after a tough training session. But don't look around for the yoga mat or infomercial device. This is a crunch-free workout! Why suffer through another boring, painful ab routine? Work your core by making it stabilize unbalanced loads. That's what it's there to do! Hang Tough: A One-Move Isometric Core Solution! Advanced bodyweight maneuvers are some of the ultimate strength tests, because trying to cheat will just leave you flat on your back. Meet the front lever, an isometric core massacre that will show you what you're made of!